This super fun and easy card should come with a warning that it is “highly addictive” both to open, and to make. 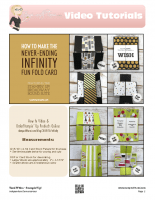 Once you see how and quick these infinity cards go together, and how fun they are to flip…and flip…and flip….you will won’t want to stop creating them. Your friends and family will be wowed. This goes down as one of my favorite cards ever. I originally shared the “Never Ending” Infinity Card back in 2011 (click here). Recently, I made these with a friend’s daughter as birthday party invites. It didn’t take us long to make 20. We printed the party details on Whisper White Card stock and attached it on 2 of the center panels that you flip to See the Lemon Lime Twist version to see this). Today’s cards are made with the Stampin’ Up! Broadway Bound Suite: Broadway Birthday stamp set, Broadway Bound Specialty Designer Paper and Metallic Pearls. The stamp set is a 2 step and I’ll share a quick and easy Stamparatus technique on the video below. Download the free pdf and catch the video for this class below. The pdf includes measurements, a template and a full supply list. We also used this Broadway Bound Designer Paper for our Stamp Out Breast Cancer Cards. Get a free tutorial as our gift when you donate to our 9th Annual Making Strides Against Breast Cancer Fundraiser team. I will be filming this how to class live at noon EST today. Join in live, or catch the replay, and learn how to make these fun fold infinity cards and enter to win one of my free prize patrols. This was so interesting. Thank you for sharing. Now any chance do you also have directions for a “Waterfall” card? I really love the flip card. That look like so much fun. I’m going to have to watch you a few more times to get it right! Thank you for doing this card!